Some comments on Candy 2 (as the person who unearthed this particular post, I guess it is no wonder that I want to comment on it :-). A very interesting point that the “Why your boss is programmed to be a dictator” implies, and which is something that I myself always wondered about, is why does it always seem that as soon as you become a boss you seem to fit this Dictatorship mold. Even people who to start with are democratic and liberal and open minded end up being dictators ( I must confess that my answer has always been that power somehow gets to their heads and makes them act like perfect bastards, but I always wondered would I have the moral stamina to be different… or would I also become a dictator like everyone else; I’ve been so much afraid to face the answer to this question, that I have very carefully and deliberately avoided being in situations where I would have any hierarchical power what-so-ever). 2), the second thing is something known is psychology as Fundamental Attribution Error – which is the other side of the coin that Dhruve does not talk about, but you will find plenty on in the SWITCH book of Dan and Chip Heath (also referenced by Peter in previous blogs). 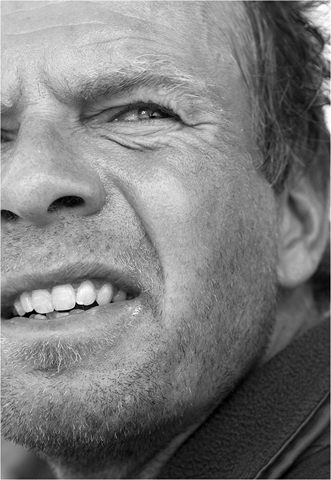 The fundamental attribution error is a bias that we all suffer from, which means that in any situation we are likely to attribute observed bad behavior as fundamental character flaw of the person, rather than attempt to check if the situation was not responsible; however when we ourselves exhibit the same behavior it is very clearly the fault of the situation (example – observing a driver passing a red light, causes us to usually call him names, while when we ourselves commit the same offense, it is… because we have a very good reason that excuses the behavior, of course). I know it sounds way too simplistic to be true, but I have been observing this change in people in my work, but never realized what caused it and how I could reproduce it predictably. I have worked over the last few months with many colleagues with whom previously I had difficult relationships. My current work usually involves situations when I offer to help them achieve a goal and facilitate collaborative meetings/ workshops for them. I have observed the most amazing changes happen to people in such workshops – they suddenly behave in very open, non-confrontational, collaborative, and creative ways. They get excited, they want to share, they value their colleagues and they appreciate their differences. And before I could have betted (if I was a betting person) that they could never ever behave like that, because they were not such type of people (attribution error again). I’ve seen this magic happen over and over again in different situations with different people, and I could not explain it, so I just took it for granted. Until I came across the SWITCH book and the Fundamental Attribution Error. And then I realized that there was no magic. People are people, they have good and bad sides, and they are mainly….well, human. All you’ve got to do is chose the situation… and defer judgment: Good situations bring out the best in people, bad situations…..
Mariela should start blogging herself. But maybe this is a situation where she feels some sort of hierarchy or being in a situation where she fears the answer on what would happen if she goes full public. There is only one way to find out. What is it that motivates people to come to work, be happy and do a great job ? If you company is looking into people and culture, here are 3 candies that could give you the answer to the question of motivation and happy people. And find some good motivators. Here is a nice 10 min video scribe of Dan Pink’s presentation of his book “Drive” that is all about what REALLY motivates people ? It’s really worth spending the 10 min video to understand why incentives that work in production environments don’t work in creative environments, and even have counterproductive effects. It is the same as applying Lean efficiency programs that were designed for production environments, and applying them blindly to white collar creative and innovation environments. Nobody in his right mind would do this of course. In essence motivators for creative workers are fundamentally different than classic bonus based motivators. My colleague Mela found the following interesting post on the Change This site. There is an interesting part about the difference between Systems Thinking, the linear engineering type of approach – where we treat people as individual components whose behaviors need to be analyzed and fixed – also called “Tamed Problems “, and “Wicked Problems”- where we have to look at the CONTEXT where the people live in. Later, the author writes about “emergent properties” in nature, and then uses this as a metaphor for the emergent properties in the relationship leader – person being led. In dictatorships, the emergent property of people being led is fear and lack of freedom. When the individual is in the position to choose it’s leader, then the emergent property of people being led is freedom. Many other things emerge when people can vote: innovation, wealth, power, competitive advantage, a free media, the attraction of talent and so on. The important point here is that real freedom brings real success. Shared systems matter more than shared culture. The most interesting part is in the section about emerging properties in the workplace and where he notes that in the dictatorship metaphor, the emergent property of the boss is power. Wow ! Nobody would want to work for a boss like this. But many people don’t have the choice, especially in the current economic climate where a having a job is priority #1 for most people. Frequent readers of this post know that i claim you always have a choice, but maybe i am reasoning from a luxury position, and the folks getting fired as part of all sorts of efficiency programs think very differently. I see so many good people go, and not finding something decent on the marketplace. Some recruiters told me they have piles of high-potential CV’s on their desk, and they expect a massive exodus once the economy picks up again. Dr. Hornstein’s “scapegoating” reminds me of my Leading by Bing training, where in the “Who am i in a group" section, we learned the hard way that also a group goes through maturation stages. One important stage is when a group gets into scapegoating. Every group does in its lifecycle. The maturation comes when somebody in the group stands up – takes his personal leadership – and says we had enough scapegoating. So Candy #2 is really about creating a culture of true personal leadership, not the leadership of a boss commanding his staff, but the personal leadership as the personal courage and to stand up, stick out your neck, daring to say the things as they are, and not making the story “better” as it moves up the corporate hierarchy. In essence caused by the phenomenon of Groupthink. To prevent groupthink, James Surowiecki says in his book that the best way for a group to be smart is for each person to think and act independently. It all boils down to having companies that make our world better. Umair Hague did once again a fantastic post this week on why Betterness is good for you and your company. He’s telling us to do betterness instead of business, pursue awesomeness instead of innovation — and maximize good, instead of quarterly profits. The tectonic shift to social investing going mainstream is going to amplify the effects above as it gathers strength. It will ensure that every marginal bit of good creates even more shareholder value — and every marginal bit of bad destroys even more. It’s nothing less than the retuning of the global economic engine itself. Good, the evidence suggests, is the very opposite of Utopian idealism. The real utopia? That was the one economists, bankers, and titans of industry promised: in a world of perfect markets and infinite leverage, companies who blindly maximized profit would lead everyone, ineluctably, to unstoppable prosperity. It didn’t work out that way. Just ask Wall Street, Big Food, Big Media, Detroit, Greece, Spain, Dubai, or anyone from the American homeowner to the Chinese migrant worker. Today’s real idealism is this: pretending that business as usual is good enough for companies, countries, the world, or the future. It isn’t. It’s time to get real: good is as sharp as a razor, as hard as a hammer blow. That’s what decades of research suggest. That’s why companies as different as Google, Wal-Mart, Pepsi, Lego, Starbucks, Nestle, Apple, Patagonia, Timberland, GE, Tata, are all, in their own ways, taking steps small and large towards it — and why customers, governments, and investors are joining hands with them on the way. Will be interesting to read Umair Hague’s upcoming book. Maybe we should invite him to Sibos. The program has just been made available here. And our impressive Innotribe @ Sibos 2010 program can be found here. As you will notice, the Innotribe sessions are coming from many sources of our company and industry. Indeed, since our first Innotribe @ Sibos in 2009 we have come a long way: from an event-in-the-event mainly driven by technology into something that is now fully part of the overall Sibos program and with contributions from many many different business and even social areas. Corporate Social Responsibility (CSR) is much more than just embracing the ‘green’ agenda. How can smart CSR strategies contribute directly or indirectly on how we manage our planet’s resources and – at the same time – have a direct and positive impact on your bottom-line? In this pragmatic session, with the help of a leading academic and representatives from financial institutions who have already benefitted from CSR, we’ll examine how ‘doing good’ is equally good for business. All this is very relevant for Innovation. What motivates people to keep coming up with new ideas during their free time ? This is about an amazing idea of a 23-year young big thinker who created a fantastic community on-line and almost by accident stumbled upon a new platform for on-line communication that could change our world. I stumbled upon this absolutely great video of a speech given by Vanessa Miemis in NYC during the Social Business Edge Conference on 19 April 2010. I am a big fan of Mrs. Miemis and fervent reader of her blog “Emergent by Design”. It’s the first time I see and hear her speak. It’s adds a different dimension. It’s a different type of engagement, and that different type of engagement is exactly what “Junto” is a about: a conversational platform between “real” people (see later on this blog). She has roughly 4 supporting slides, and talks from the heart, with only a small sheet of paper with probably a couple of keywords and key statements. That’s how really super keynoters do their thing. In this video she talks in an almost shy way about what drives her, and makes one after the other bold statement about the way this society does (not) work anymore. I was mainly blown away by the section on Modeling behavior, some elements in the vision alignment, and definitely by her description of Junto. Encourage a culture of collaboration, there is a certain type of behavior that we are modeling, and one that is based on a value system that is predominantly different than the one that exists in society and business today. And its difficult to expect a paradigm shift when the current model rewards selfishness, and hording of information and exploitative behavior. There is this new way. For the greater good. A new global conversation and collaboration platform. that would sit on top of the web and that would accelerate the rate of taking an idea to action. And we are calling it JUNTO. Enter Junto’s vision: a 3D space, where it’s live-streaming video, with video streams of us human beings. On top of that a profile system, automatically generated by the conversations you are having. It’s a different kind of transparency on who your really are. On top of this this reputation system that would be build into these trust networks, and virtual currencies, … and it goes on. It’s like 5 people having a public conversation about a topic that interests them, and 500 people sitting in the back-channel. It’s all open source. They don’t want to monetize the tool. It’s sounds a lot like our “enabling collaborative innovation” theme of Innotribe. It sounds a lot like the “advancing critical dialogue” tag-line of Sibos. I truly believe that this tool could bee the basis from which a new global economy and a new global society can emerge from. Wouldn’t it be cool to address this a a theme at Sibos. In front of 8,000 bankers ? Wouldn’t it be cool to experiment with Junto – yes, live i mean – during Innotribe at Sibos ? We plan other cool remote interactive stuff anyway this year. Just have to keep you curious here, as we have not yet fully worked out the concept, but if we pull it off, it will be really cool. Sort of first off. Technology is the tool, but not the builder. We are the builders. I challenge you and ask how we get better use to tools to connect and to inspire, so that collectively we can become better builders. I need to discuss with the Sibos team, but I’d like to invite Vanessa to our Innotribe @ Sibos 2010 in Amsterdam to be part of the keynotes on “the big tectonic shifts” and in our Gen-Y stream. Let’s Prepare the Future ! This article is a cross-post of an essay that i prepared for The Fifth Conference and that was published this week. Over the past 20 years we have witnessed a fantastic growth in and wealth of technologies. ICT technologies have started permeating our daily lives. Medical science and biotechnologies have increased longevity significantly. Other technologies (Nanotechnology, AI, Robotics, etc.) have kick-started. 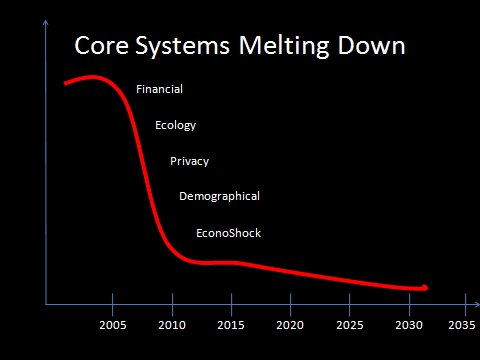 Our worldwide financial system is going through a “meltdown”. The old game of greed is being replaced by an all important requirement: trust. Ecological, ethnological and demographical shocks (see also Geert Noels, author of Econoshock) are turning our systems upside-down: Green and Energy conservation thinking are now the mainstream. The East-West shock: economic power is shifting from the Western world to the new economies of APAC and BRIC+ countries. New forms of communication via the internet (blogs, wikis, social networks such as Facebook, Twitter, Netlog, etc.) propose a new paradigm in respect to privacy. All these fundamental changes give us feelings of discomfort, disorientation, confusion and loss of control. 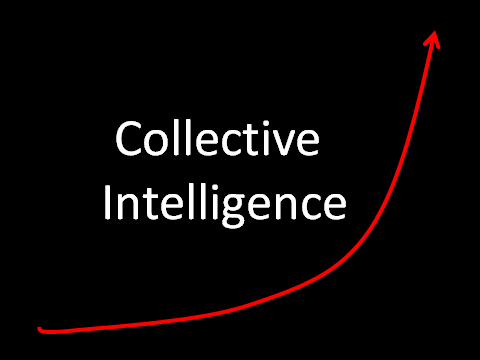 Although our “collective intelligence” indicates that our old models do not apply anymore, our “hardware” seems not to have caught on. We have not adapted the way we are organized hierarchically; how we look at governance. Our traditional ‘system thinking’ got stuck and did not follow our ‘collective intelligence’. Barack Obama describes it as the ‘audacity of hope’; innovators, planners, academics and authors are referring to ‘dreamtelligence’ as a new, vital, and visionary way to use play, fantasy, dream-thinking and innovation to kick-start ideas and stimulate community engagement. A fantastic call for and revival of authenticity for ourselves and our leaders. Furthermore, having true leaders; with charisma, the power to attract, integrity and authenticity. The Net-Generation (now young adults, 15-30 years old) have grown up as ‘digital natives’. They will be tomorrow’s leaders. What THEY think will co-form our future. The future will not be invented by today’s generation. This Net-Generation lives differently. They are “wired” differently. For them multitasking (multi-window chatting, gaming at the same time as listening to music, looking up information on the internet, being mobile, etc.) is very common. 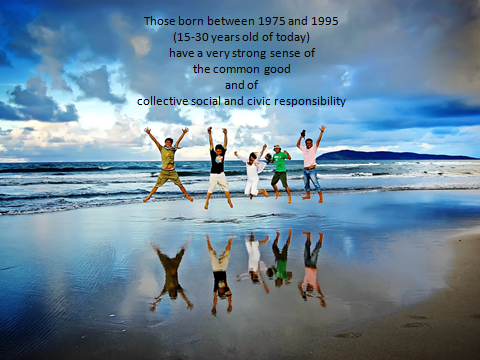 They also think differently (deeper and more authentically), and have a very strong sense of the common good and of collective and civic responsibility. Today our technologists are capable of crafting a human ear in their labs. We are now in a position to create and grow cells, tissues and even bodies. Artificial Intelligence is back: by 2030 our computers will be able to think, be self-learning, self-healing – some will even be able to have a consciousness. Self-learning robots will soon be mainstream technology. Mercedes and BMW already have cars in the pipeline for 2012 that can drive entirely automatically, better than a human counterpart. The emergence of Google brings forth the concept of the “Global Brain”. The internet today is already a tremendous source of information. Today’s search experience will pale in comparison to the mechanisms we’ll have in 20 years. All knowledge will be available anywhere, anytime, wirelessly via brain-implants. Social networking is already revolutionizing the way people and companies are communicating. It is interesting to note that these technologies let us evolve from a system-to-system communication paradigm towards a human-to-human one. Brain-wave helmets and chip-implants will give humans better sensory perception. By 2030 we will see the emergence of “super-humans”. In such a dramatically changed context, what will make us “human”? 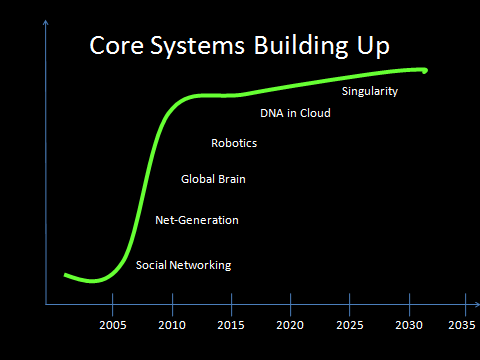 A lot of these future scenarios are described by Ray Kurzweil’s “Singularity” concept. This is the moment when man and machine truly blend. Kurzweil claims this will happen around the year 2030. And the pace of all these technological innovations is just increasing exponentially. In the next 20 years we will witness technological breakthroughs tenfold those of the same previous span of time. All this evolution calls for a re-thinking of our value-compass for the future: We must carefully re- think how all this will influence the way we will work and live. What sort of quality of life should we aim for? What will be the socio-economic impact of all this? How will we want education to be structured? What areas of society will we still want (and be able to) influence? are competitive in this new era? Will we lead the change, as opposed to being mediocre followers? I believe it is time for action. A place where “smart people” can meet. Where experts from different technological domains share their insights for 2030, cross-pollinating each other’s disciplines. Indeed, “savants” from different contexts & worldviews can act as our “eyes” and offer a perspective on how we will live and work in 2030. How our education is best organized will also be addressed. We will investigate what our ideal value kit for that era should be, beyond traditional corporate culture. Moreover, with a culture of sharing and exploring – where we live committed to teams, groups, communities, regions and countries –a deep respect for the participating individual humanistic identities will nevertheless be maintained. We don’t have to wait until our politicians have made up their minds as to whether or not they should invest more in innovation. I cannot accept that it would not be possible to raise private funding for such an organization/movement/tribe. The resulting new models and scenarios will demand speed, creativity, dynamism, perseverance, courage, knowledge and working together in a multi-cultural context. This new society makes a plea for the respect for individuality, freedom, mobility and quality of life. This paradigm is all about designing, exploring and organizing change, learning and fine-tuning as we go. Giving guidance to teams, organizations and leaders on how to surf these waves is part and parcel with this. Missing the first technology wave of speed and creativity will result in loss of economic relevance. 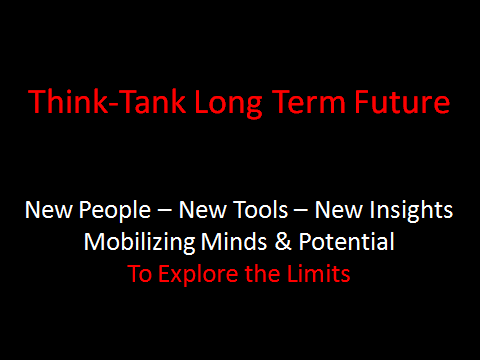 Missing the wave of the new value kit will result in losing our Net-Generation; our brains for the future. 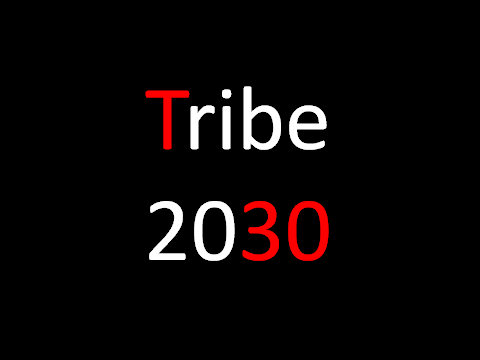 This is about preparing ourselves and our region for 2030.
Who wants to join the tribe? Who is a believer? Let’s debate this idea on- and off-line for a couple of weeks. If there is enough interest, let’s meet and make this happen. It’s quite some time ago i did a post with brand new content. It’s partly because i also have a family and a job, but mainly because i only feel the urge to blog when i have real content to contribute. These days i also share an awful lot via twitter: that’s where the day-to-day action is. So if you are interested in my lens on technology and values for the 21st century, you can also follow we on twitter @petervan . There is an almost daily stream of tweets on these subjects. I “reserve” the blog to share some more elaborated thoughts on stuff that keeps me going or that touches me one way or another way emotionally, in the way i am. And I’d like to share what happens if you truly stand for who you are and have the courage to stand up and stick out your neck. The title of this post is of course a word-spiel on get-a-life and get alive. The discussion was part of an off-site recently attended in the wonderful city of Barcelona. It was about 20 years ago i was in Barcelona, and the only thing i remembered were the ‘”Ramblas” and the “Plaza de Espagna”. Given my education as an architect (non many people know this ;-), i of course knew that Barcelona was the city of the Sagrada Familia of Gaudi. The off-site was facilitated by Dan Newman and his team from The Value Web. The off-site was our reflection moment about our company for the next 5 years. Dan really “got me” with his opening speech: he used two words that deeply resonated very strong with me – at an emotional level. Especially in sculpting the old with the new. Old game and new game. And that the old and the new should be connected by more than just a link or a tunnel. That the end-result should show a deep sense of unity. And that this “sculptural integrity” and other architectural thoughts were the also the basis of facilitation work and techniques of the Value Web, because that was also how group dynamics could be looked upon. The words entered by body and mind, as they reminded me of a piece of my true self and my youth 30 years ago when i was making drawings and sketches myself of the most bizarre and bold architectural designs. Dan mentioned also a book: “The Timeless Way of Building” by Christopher Alexander. What is it that makes a building “work” ? When you see something that works, you just know it. And it’s something that has a timeless quality. I was intrigued by the subject, and kept researching, and quickly discovered the site of Tomorrow Makers. The tendency to let yourself be guided by intuition instead of acting under pressure of fear, forced ideas and pre-conditioned behavior. A total loss of interest in: – judging others, convicting yourself and preoccupation with things that create conflict. During the off-site, Dan did something else that was brilliant. He took us out of the hotel into the city. In our case we went to the CosmoCaixa Barcelona, the Museum of Science. Besides being a perfect metaphor for blending old and new with “sculptural integrity”, it also put all of us in a different context and mindset to look in quite different and innovative ways to our off-site subject. At a certain moment, we could form a small group of people, sort of a tribe around a subject that was not yet addressed. I put the word “excitement” on a post-it, and look: 10 min later, we had 7 or so colleagues interested in discussing the subject. I asked a simple question: “how excited do you get by the work done so far at this off-site” and rate it on a scale of 1-10. To my astonishment, the average rating was 3. So we then looked for the root-cause of this score. A lot had to do with company culture, but also by the need for a new vocabulary, and not just words, but a vocabulary that was inspired by the value set that is needed for the 21st century. In a follow-up session on people and culture this topic re-appeared in full force. our minds, hearts, and minds. I have used the following slide many times in my postings. In black the old game: full of macho behavior and Machiavellian attitudes and states of mind. In white the new game. With true, genuine interest in the other and the true self – not based on tricks or quick fixes. The discussions on these topics were deep and full of enthusiasm. We were looking at talent development, both the professional skills ànd the Personal Development side of it. And i keep on fighting that “Personal Development” is NOT about “soft” skills. and nurturing them so that they can function optimally in today’s highly connected networked society. You need to “train” and get exposed to a number of essential hard skills and values for the 21st century. Do you feel how powerful this is ? Should we not invite her to Sibos ? To be part of Innotribe at Sibos. As part of our “Gen-Y meet Bankers” Face-to-Face interactive workshop ? Maybe with the help of some strong Gen-Y-power, we will be able to keep the sharpness of our ideas and dreams. Because at the end of the off-site, each team had to boil it down its ideas to a pitch of 5 minutes and I was surprised to witness how in this pitching work, we lost quite some of the “cutting" edge”. Also surprised on how fear creeps in when people are volunteered to deliver the pitch to the executives. And a strange behavior of watering down the message, and even scratching the most provocative words in the end deliverable. By 2015, our company should be in the Top-10 of best companies to work for in the financial industry. Worldwide. “Do no evil” is not good enough anymore. “Great to Good” is the new paradigm. At this moment, I decided to have a short break in my blogging activity, and go for my Sunday trip to the bakery. I bumped into a friend, who shared me a wonderful story about going for your dreams. The story was basically about context. Of not waiting to be called. Of doing what you intuitively know is right. What works. In his case it was about seeing a wonderful motorbike, feeling it was just designed perfectly, and following your intuition and impulse and buying the motorbike. It happened to be a Can-Am Spyder Roadster. This was not just about buying something desirable. It was a story about contextual living. About flow. About following your compass. And not delaying your dreams till when you’re dead. You can find “flow” is everything you do. From the most banal activities like cleaning or motorbike maintenance to writing an inspiring blog and making a pitch that makes others dream and wanting to go after their dream. When i started this blog in April 2009, i wanted it to be in line with my purpose in life “Inspire other people to dream” – and execute their dreams. I hope i have not disappointed you so far. Last week, somebody said i should start writing a book. Maybe i will do that. Maybe using the funding model experimented by Stowe Boyd fro writing his report on Social Architecture: Microstreams In Business. Let’s eradicate the macho culture of judging, being cynical, and control freaks. Let’s build a culture based on open mind, open heart and open will. Are you also fed-up waiting on the side-line and do you feel the hunger to join me on the drawing board to help us sketch the “sculptural integrity” required for the 21st century ? Then please use abundantly the comments feature of this blog. Doing what you want to do, not waiting to be called. Stand-up and stand as you are. In your true self. Without fear. Living your dreams.